The brain response associated with blue light could help people adapt to emotional challenges more easily. (Health.com) -- As winter approaches and the days get shorter, your mood may get darker too. Sunlight deprivation can make people feel lethargic, gloomy, and irritable, and for some it can lead to the condition known as seasonal affective disorder, or winter depression. Though preliminary, the results suggest that spending more time under blue-enriched light -- rather than the white light most bulbs emit -- could help stave off bouts of the blues and make all of us feel a bit brighter during the winter months. Light makes it easier to read a book and find your way around, but it's much more important than that. By affecting hormones such as melatonin and nutrients such as vitamin D, it also has a big impact on the body, mind, and behavior. "For thousands upon thousands of generations we were hunter-gatherers, out in the daylight and exposed to that blue sky," says neurologist George Brainard, Ph.D., the director of the Light Research Program at Thomas Jefferson University, in Philadelphia. "Since about a century ago, when Edison and others developed electric lighting, we've become [a] predominantly indoor-dwelling species. We've been removed from our natural stimulus." Studies have shown that blue light improves alertness and mental performance, but researchers haven't fully understood what makes it different from red, green, or white light. Now they're getting some answers. In the new study, 17 healthy volunteers were placed in a dimly lit lab, hooked up to a brain-scanning machine, and exposed to 40-second bursts of alternating blue and green light with periods of darkness in between. As the lights came on and off, the researchers played snippets of recorded speech that sounded angry or neutral, as a way of provoking an emotional reaction. When they analyzed the brain scans, the researchers discovered that blue light, more so than the green light, seemed to stimulate and strengthen connections between areas of the brain involved in processing emotion and language. "We found that if you have an emotional stimulus processed by the brain, it is quite impressively affected by light and wavelength composition," says the lead researcher, Gilles Vandewalle, a brain expert at the University of Liege, in Belgium. However, they suspect that the brain response associated with blue light may enable people to adapt to emotional challenges more easily, which could help regulate mood over the long term. Can blue light fight the blues? "This is going to prove to be a very important study," says Brainard, who was not involved in the new research. He explains that the findings may ultimately help improve light therapy, a common treatment for seasonal affective disorder. In conventional light therapy, patients stare closely for 30 to 45 minutes at light boxes that emit bright white light (which comprises light from across the spectrum). The treatment can be highly effective, improving mood within just a few days. But this intense exposure can cause side effects, such as headaches and eyestrain, Brainard says. Although previous studies that tested different color lights in light therapy showed mixed results overall, a 2006 study led by Brainard found that blue light is better at relieving the symptoms of seasonal depression than red light. "By finding the best wavelength of light, you can use lower levels and still evoke the same response," he says. The study findings also help explain how light therapy works. "Before, we thought that light therapy was beneficial to mood mainly through the regulation of biological rhythms and melatonin secretions," Vandewalle says. "Here we propose an alternative mechanism, or at least an additional one, showing that light can also directly affect emotion." Time for a "lighting revolution"? Using blue light in light therapy might be a good thing, but we may also want to think about changing the lighting in our homes and offices, says Vandewalle, pointing to previous studies that found that people feel better, perform better, and sleep better when working under blue-enriched light as opposed to the light given off by standard bulbs. While blue light dominates outdoors, indoor lighting emits very little of it. "The first lightbulbs produced were only able to produce a yellowish kind of light," Vandewalle says. "We may have just gotten used to it, leading us to prefer the warm, yellowish light over bluish lights that generally appear more cold." 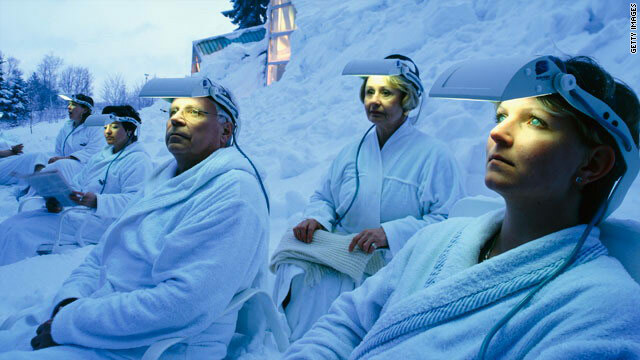 In the northern hemisphere, the amount of blue light people absorb tends to peak during the summer and drop in the winter, as they spend more time indoors. A 2009 study conducted in England found that in the early evening hours, blue light accounted for 40 percent of the light people absorbed during the summer months and just 26 percent in the winter months. Vandewalle's findings may open the door to new ways of thinking about lighting. Enriching indoor lighting with more blue light could potentially have an impact on mood and energy in everyday life, even in people who don't suffer from seasonal affective disorder and experience only mild gloom during the winter, Brainard says. "We ultimately need to be thinking about a revolution in lighting," he adds. "It is in our best interest to have not only light that's adequate for vision but light that's also optimal for our biology and behavior. This is a very exciting development, but it's still in its early days."